Thom has been learning about space at preschool lately and wanted to try and make some more space games for home. So we decided to make some space play dough based on the really easy glitter play dough we made last year. 1. Mix all dry ingredients together in a pot. 2. Add all wet ingredients to the dry ingredients including food colour to your desired colour (1-2 drops is usually plenty). 3. Cook on a medium heat on the stove for 3-5 mins, stirring constantly. Mixture might look a bit lumpy for a while and then suddenly come together to a thick (almost) play dough consistency. 4. Remove the pot from the stove and add your glitter (use however much you like). I used 3 tablespoons for a single batch of play dough. Mix well. 5. Once glitter is combined you can scrape the play dough into a container. The container needs to be air-tight. Hope you enjoy this cool take on my glitter play dough! I thought I'd make something a little different this week. I have lots of friends with young children and have been thinking about presents I could make to give as little gifts - or to go towards bigger gifts. Thom loves playing with his play dough - his Mama made it for him and it has just lasted forever. But I thought I might sparkle it up a little bit for Christmas and make some glitter play dough (in keeping with my current love of all things that sparkle!). It's cheap to make, great for kids and you can get everything you need to make it at the grocery shop! This is my Mum's recipe (plus the glitter!). To make the quantities shown in my photos, I halved this recipe and made an individual batch for each colour. 4. Remove the pot from the stove and add your glitter (use however much you like). I used 1 tablespoon for each batch of play dough, but I think next time I might use a bit more! Mix well. 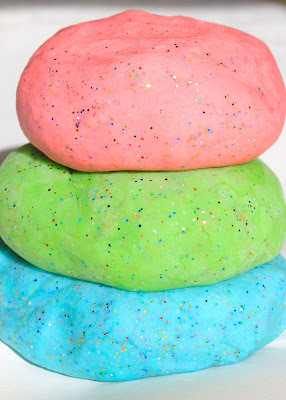 Safety Note: Unless you use edible glitter for this recipe, make sure the kids don't eat this play dough - I know they tend to nibble at it when given the chance! We are two friends, Caity and Emma, and we love everything handmade and creative. Our blog is all about making beautiful things for our homes and gifts for our friends and families. We also want to share our ideas with you! Each of our posts give you step-by-step instructions on how to complete our projects.... so that you can try them yourself at home if you'd like to. ENJOY! Exciting new shop + studio now open! why the thom haus name? Lots of people ask us what's behind the name of our blog. "thom haus" is based on the name of Caity's little boy Thomas and Haus being the German word for 'house' - which makes Thom's house or Thom Haus. A Children’s Cubby House Now… and a Room for Grown-Ups Later! Please kindly note that our ideas and creations are not to be copied for retail purposes and are to be given appropriate recognition where used.